Welcome to another edition of DT's cure for the Monday morning blues -- What Am I? In this better than winning a wing eating contest for termites on the spruce goose game we find a random picture of a car and you get to guess what it is. Today's featured image comes from a advertisement for a car you don't see very often. Just what am I anyway? Comments below. Update with answer below. DT regulars Andrew Liss and Fleetwood T Brougham (what were his parents thinking...no middle name, only an initial) simultaneously solved the riddle -- with the photo replay showing Andrew Liss by a nose. 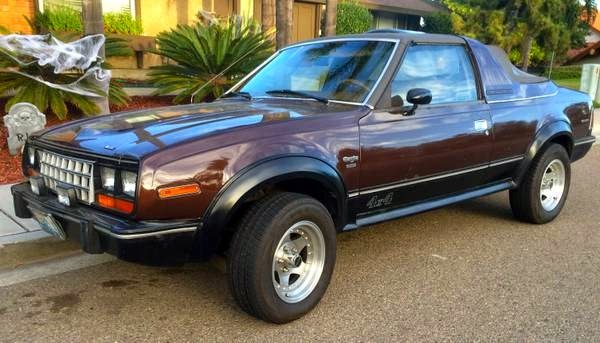 And what a keen nose it is, he must have smelt the wiff of failure on this 1981 AMC Eagle Sundancer convertible offered for $6,900 in Cardiff, CA. 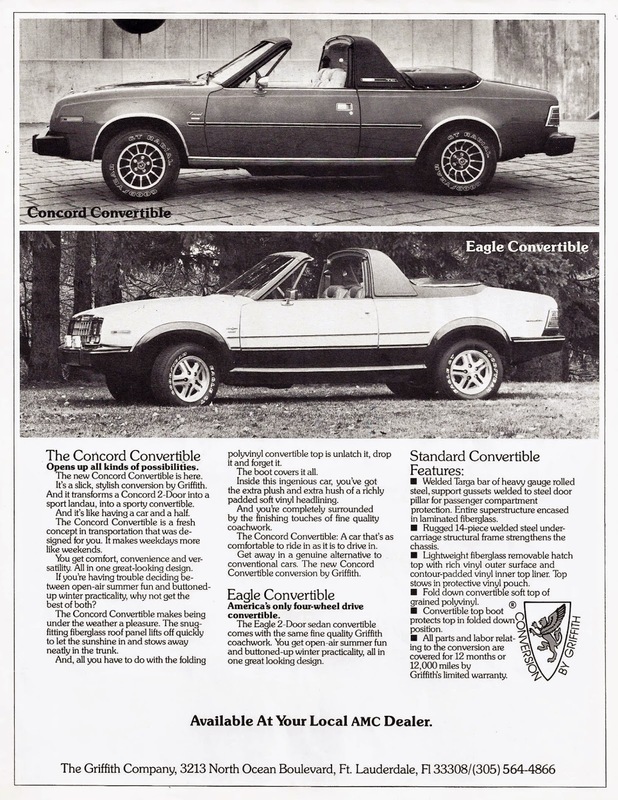 The Eagle Sundancer was a coach built convertible version of the 4X4 Eagle coupe, with top hacked off by Griffith of Ft. Lauderdale, FL. It was the domestic equivalent of the Toyota Celica Sunchaser and sources on the interwebs claim only 200 exist. Labels: Eagle, Sundancer, What Am I? Andrew --How on earth did you know what that was? Same goes for FTB, did you guys grow up in the back of one? I thought I'd found one that would stump everybody! It was a tip from ANCMatt. Oh well, here's the car anyway. My best guess was going to be "domestic" and "tasteless". So I was on the right track. No one has to wonder why AMC disappeared. 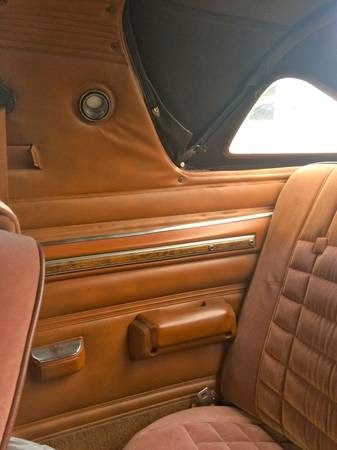 While the car has 27k original miles, strangely the steering wheel has 327k miles. Bleccch. Maybe all the steering wheel wear is from the neighborhood kids climbing in through the open top and pretending to drive it off a cliff? That is impressive, Andrew and FTB. When I submitted this, my attention in this photo was on the sun bleaching. But in isolation from other pics of the car, with eyes squinting you could convince yourself you are looking at a boat's interior, the design and finish is so ham-fisted. Actually, that's an insult to boat designers, but I think you get my drift. A 1982 AMC product with the top cut out. Probably about as much structural integrity and rigidity as a hot slice of lasagna. ~ Eagle Sundancer Pantydropper edition. Only 6.9 k ? Sold. Always good to get a visit from the professional Baur spotter -- and you are right on about the American auto manufacturers being shy about rag tops in the 70s, but they did build a fair number of T-top style cars in the meantime -- Vette, Camaro, Mustang, Cordoba, etc. My initial guess when I saw this car was the Toyota Celica Sunchaser. Same goofy and ugly half-targa, half Prairie Schooner, roll-over hoopty action.